Your hardwood flooring will last for years with few to no issues. If you do have any issues, they are usually easily fixable. Hardwood is one of the most popular flooring choices in the world. Homeowners choose hardwood flooring for a variety of reasons: classic beauty, versatility, durability, and so many others. Your hardwood flooring will last for years with few to no issues. If you do have any issues, they are usually easily fixable. Here are 3 of the more common hardwood flooring issues and how to avoid them. If you choose a high-gloss finish for your hardwood flooring, keep in mind that it takes a considerable amount of diligence to make it stay that way. When you see glossy photos of shiny, flawless hardwood, it makes you want to replicate that in your own home. 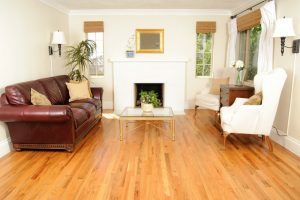 It is important to bear in mind that, like a shiny car or motorcycle, you will need to clean and polish your glossy hardwood often in order to maintain that sheen. Dents in hardwood flooring are actually pretty common in the lower grades of wood. Softer species may also dent easily. To avoid dents in your hardwood flooring, call Jason Brown Wood Floors. We bring our years of hardwood flooring expertise to every single job. Your beautiful new floors will be installed by our expert technicians who will ensure everything is done right and your hardwood will be with you for years to come. When metal is exposed to the elements, it oxidizes and this is called rust. When exposed to light, your hardwood can oxidize too. This process causes the planks to darken. Fortunately, this doesn’t really compromise the integrity of the floor; it just might look unsightly at first. When exposed to intense amounts of sunlight, the discoloration becomes far more pronounced. This entry was posted on Friday, February 23rd, 2018 at 2:35 pm. Both comments and pings are currently closed.